Shortly after returning from the 2000 North American Rail Pass 33 Day Trip, I checked my Alaska Airline Miles that I earn riding Amtrak West. With plenty of miles earned, I made my choice to go to Hawaii which would be the 50th State that I would ride a train in. I called the Partner Desk at Alaska Airlines who set me up on a round trip going via San Francisco and returning on a direct flight to LAX. I then called the Hawaiian Railway in Ewa Beach, Oahu to tell them of my upcoming visit and that I would like to ride their train. I suggested that a press release might be in order due to the nature of my visit. Was I doing something that no one else had ever done? A few nights later, Larry Howard of the Hawaiian Railway Society called me and we discussed matters. He offered to find me an inexpensive hotel room through some of the people he knew on Oahu. We kept in contact over the next few weeks and he found me a room in Waikiki at the Radison Prince Kuhio for four nights at a very low price. One Friday afternoon, I received a call from Will Hoover of the Honolulu Advertiser who wanted to write a story on me and my upcoming visit. The article came out about a week before my visit with Will calling to apologize for it being out early and told me I could go on-line at their web site and read it which I did and made copies for my friends. Two days before my trip, two copies arrived in the mail. With that, I packed my bags to begin my 50th State Adventure. 11/9/2000 I drove my Geo Metro at 4:00 am to my friend Brad Tarr's house in Santa Fe Springs and he drove me to LAX, dropping me off at Terminal 3. I flew north to San Francisco on American Airlines Flight 191 on a beautiful clear morning with a magnificent view of the California Coast. We arrived at SF early since we were the first in line at LAX. I strolled to my connecting gate for Flight 39 to Honolulu. Leaving San Francisco was wonderful with the downtown and Golden Gate in view. From that point on just the clouds and ocean were with me doing word searches and listening to music. I even squeezed in a nap on the flight. As we descended onto Oahu, a beautiful rainbow greeted me to my 50th State as we made our way to touchdown in Honolulu. Walking off the plane, I feel like I already had accomplished something I mean how many people ever visit all 50 States? I followed the signs to the Rental Car counters and Avis had me checked in within two minutes. I got a great deal with them because I had traveled on American Airlines. A shuttle bus took me to the lot where a Chevy Prism had the keys in the ignition for me waiting to go. It was my easiest rental car yet. As I drove away from the airport, a thought hit me, how many states had I driven a car in? Seven versus forty-nine that I had ridden a train in. Driving east on H1, I headed to Waikiki to check into the Radison Prince Kuhio for my stay on Oahu. I received a 28th floor room with an ocean view. I walked out on my balcony to see that I was a block from the beach with a partial view of Diamond Head, my first destination of the trip. I drove to it on the coastal side and around on the north side I found the entrance to the park. I drove the access road that leads you into the crater via a tunnel. 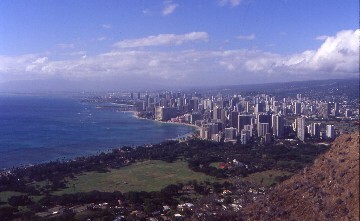 I parked the car and paid a dollar to be able to hike to the top of Diamond Head. What a hike it was! A paved trail starts you off for the first part before turning into rock. Switchbacks are then used to gain elevation to a staircase with 33 steps. A long dark tunnel is next (bring a flashlight with you). You next climb 99 steps that take you into a dark cave with two spiral staircases inside which exits into a room. To exit, you must crawl on your hands and knees to get outside. Take the path to the last staircase and climb it and you will be standing on the summit of Diamond Head just like I was on this day. What a view! They said to give yourself an hour and a half for a round trip hike but I did the climb in twenty-five minutes up and nineteen minutes down. I paid for a certificate that I did climb Diamond Head and at the bottom bought a Diamond Head Summit Club Member T Shirt. I returned to Waikiki, explored my new environment on foot before the activities of the day caught up with me and called it an early evening to rest for my next days planned activities. Waking up early after a great night's rest, I drove to the Arizona Memorial which I arrived at 6:45 am and to be first in line for the tour. They open at 7:30 AM and twenty minutes into my wait, a tour group arrived led by an ex army officer who gave a free commentary to anyone within an ear shot. I learned a few things that led up to the attack as well as getting tips on which side of the theater to sit (left down front) so you can be first out for the boat sitting on the right side for the best view of the memorial. They let me in at 7:30 and at 8:00 the movie showing you the scenes of the battle took place before I took the boat out to the Arizona which was quite a moving experience for me. 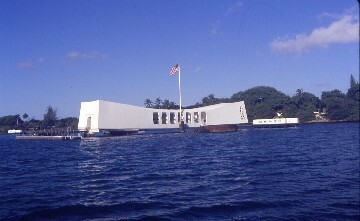 For the return trip I was first into the boat taking the rear row of seats knowing that I would get the best view of the memorial as we headed back thus ending my USS Arizona Experience. 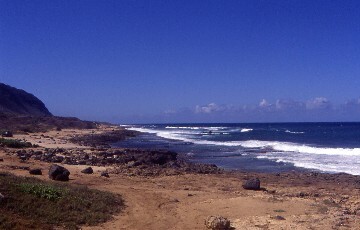 Back at my car, I started my driving tour heading west through Pearl City to reach H1 to Kapolei and then north on Highway 93 along the West Shore to the end of the road at Kaera Point State Beach, where I laid out on an empty beach. On the way there I had stopped at Kahe Point where I found railroad tracks. Could this be where my ride on Sunday would take me? The tracks head north about two more miles but there are two bridges missing. I learned later that the tracks had once extended all the way along the coast to the north side of the island. On my southern return, I made a side trip up the Waianae Valley just to see what was up there. I retraced my route back to H1 and exited at Highway 750 crossing the saddle of the island with all the pineapple fields owned by Dole. 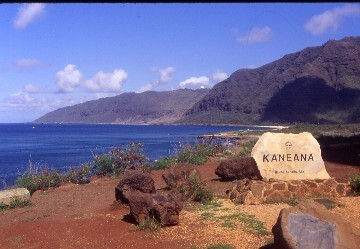 I passed through the Scofield Barracks before taking Highway 830 down to the North Shore to Highway 930 which I took west to the end of the road to the north part of Kaena State Beach where I laid out on an empty north shore beach. Returning east, I made my way to Highway 83 which would take me around to the east side of Oahu. On the North Shore I passed through Wailau, Haleiua, Waime Bay, Sunset Beach and Kawela before the road turned south at Kuilimi Point. I drove by the Kahuku Sugar Mill and the Polynesian Cultural Center before stopping for lunch at Haulu. I laid out on an empty beach at Kalaipaloa Point on the East Side of Oahu before continuing my drive by Kahana Point, the Croaching Lion and Kapapa Island prior to reaching Kaneohe. 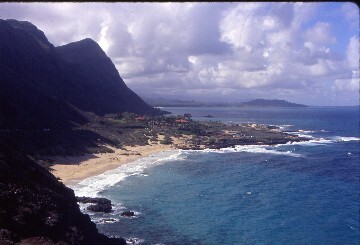 I made my way on Highway 72 through Waimanelo Beach, out to Makapuu Point. After a picture, I went around to the south side of Oahu. I stopped at Koko Head Regional Park. After another picture I stopped at Hanauma Bay before returning to Waikiki via the south side of Diamond Head. I walked down and laid out on a crowded Waikiki Beach thus I had laid out on a beach on all sides of Oahu. I spent the evening back in my room having a well deserved rest. I woke up early this time headed to a swap meet at Aloha Stadium to get a Hawaii Rainbow Warrior Hat for Conductor Christy Pacheco as none of the shops in Waikiki had it. I paid fifty cents to get in and after walking around found a tent where the woman went through fourteen boxes in search of that hat which she did find. I tipped her well. On my way back to the car I found a booth selling ten T-shirts for twenty dollars. This took care of me and gifts for several other people. Back on H1 I headed up H2 up to Wahiawa and back to add that route to my driving miles. Back on H1, I took Highway 76 down to Ewa and Renton Road to its end where the Hawaiian Railway is located. I met Larry in person and several other members who were about to go out on a track gang. I was invited to ride along but for the first time in my life I declined a train ride because tomorrow was set to be the big day. I looked at their collection of equipment and did my photography. I was impressed with all that they had. I returned to H1 which I took to H3 which heads to the East Side of Oahu through a tunnel under the Koolau Mountains to the end of the road at Kaneohe Marine Corps Air Station. With that, I had now driven every Interstate Highway Mile in Hawaii and the first state that I had done every Interstate Highway Mile in. It was a very beautiful drive. I returned over the Lifelike Highway through the Wilson Tunnel to H1 before heading back across on the Pali Highway. I stopped at Pali Lookout which is one of the windiest places on earth. It was so windy, that when a tour bus of Japanese ladies came out to the lookout in some very skimpy outfits that the wind ripped off about half of the woman's blouses causing a very comical reaction to take place. If only they would have been European Women they probably would have posed for a picture for me. Just proves you never know what you are going to see when you travel. I went down to the bottom through the Pali Tunnel before I made a U-turn retracing my path to H1 and returned to Waikiki. I walked to the Honolulu Zoo before spending the rest of the day relaxing knowing that tomorrow would be my big big day. Sunday morning, or Day 2126 of my sobriety found me in high spirits and with loads of energy knowing that today I would be riding a train in my 50th State. In order to kill time until that moment, I decided to visit the National Memorial Cemetery of the Pacific located in the Punchbowl to take in the view from that location. It was an absolute beautiful day with a glorious view of Honolulu, Pearl Harbor, Waikiki, Diamond Head and the Koolau Mountain. The monument was outstanding to look at and read thus completing my bombing of Pearl Harbor Experience. I drove out to Ewa which did not seem to take long. When I pulled through the gate to park my car I noticed that there was a sign on the Ewa 1's boiler cover, which is a 0-4-2T on display. As I walked up towards it, Larry Howard comes out and wants a picture of me by the two signs. 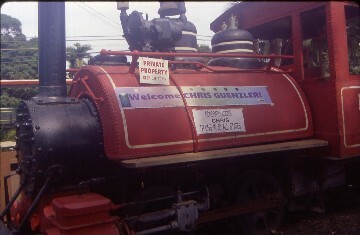 The top one read "Welcome Chris Guenzler" in the form of a banner and the one under it read "Congratulations 50 States 50 Train Rides." I was extremely proud and deeply touched by all this. I had my picture shot by the Ewa 1 by various people and Larry shot one with my own camera. He then introduced me to the other members of the society who came out for this event. They congratulated me on what I was about to accomplish. I visited their gift shop and bought several items to remember my visit. Will Hoover showed up next and we repeated the pictures and then toured the grounds with me as the guide. The train was already sitting out on their mainline ready to be boarded. The engine was their 423, a 45 ton narrow gauge Whitcomb diesel-electric locomotive which once operated for the US Navy and was restored in 1997. It will push the train out and then pull the train from the end of the line at Kahe Point. 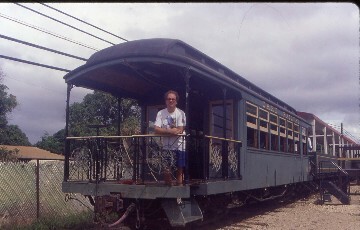 The train was four covered open air coaches and the car I rode in on my historic trip was the Parlor/Observation Car 64, also known as the Ambassador built in 1900 for the Oahu Railway and Land founder, B.F. Dillingham. The car was constructed of Birdseye Maple, Koa and other woods. Its lavish interior includes a marble sink top, commode and galley. It is an absolutely beautiful car. More pictures were taken as I boarded the car and even more as I sat out on the observation platform prior to our high noon departure. With a toot of the horn by Larry, the train started moving and with one turn of the wheel, I had completed my goal of riding a train in every state of the United States of America. Will and I laughed about that as we headed west down the narrow gauge tracks. To the right of the train is the Barbers Point Naval Air Station which we would run along for three and a half miles. To the right is where the former Ewa Plantation sugar cane fields once were. The first part is a construction site that is now used by local motorcyclists who make very good use of its ups and downs. As we proceeded at twenty miles an hour I listened to our brakeman and Will talk about what used to be along the line and I received a very good education. We passed the spot where the spur used to go into the air base and a few minutes later our brakeman hopped off to flag us across the road at the main entrance to the Naval Air Station. I really enjoyed riding out in the fresh Oahu air and the ability to have a 180 degree clear view. To the north there is an old quarry where they mined coral to use for the runway at the air station. Looking inside the base I see housing that is still in use followed by buildings which are closed with some in the process of being torn down. We passed the highest point on the line at a great height of 68 feet in elevation right before Jensen Siding which has some flat cars of steel for those two missing bridges past the end of the operating line. Off to the north is the ever present Waianae Range of mountains with very dark clouds hanging over them. As always, I am on storm watch. 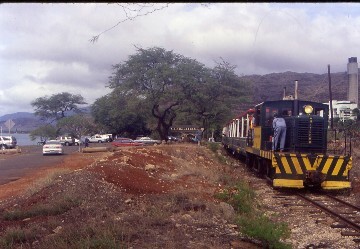 The train stopped to flag Kalaeloa Blvd which leads out to Barbers Point and the industrial area there. As I arrived in Oahu, a plane flew right above it with me getting a good aerial view of it. Right before that road we passed an unused desalinization plant with the rumor here being that they will be building a larger and improved version in the future. The tracks head straight through the Ko Olina Resort on the best track of the trip. The reason for this is when they built the resort they regraded the whole area. To do that the contractor had to remove the railroad and then rebuild it brand new. It was a win/win situation for all parties concerned with the railroad getting the best part of the deal. The Hawaiian Railway now passes through golf courses and landscaped grounds with a marina off to the southwest. Further along, there is a resort hotel to the west and a wedding chapel complete with steps from the train platform if anyone included the train in their wedding plans. 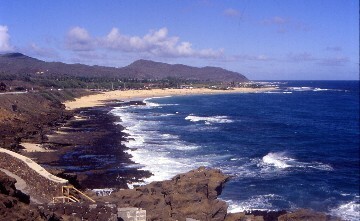 The railroad now has reached the shore of the Pacific Ocean and travels north another half mile with Maiu Point standing out against a darken sky. 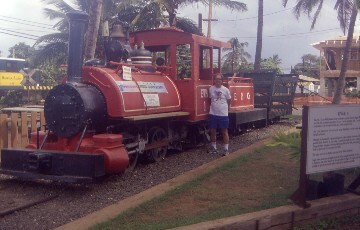 The train reaches the end of active tracks at Kahe Point and the end of my first leg of my train ride in my 50th State. I had completed my goal of riding a train in all 50 States of the United States of America. On my return trip back to Ewa, I just sat back, relaxed and watched the sky turn darker. It was a great day in my life but the threat of rain today may have kept people away from riding the train. Will was enjoying the train ride just as much as me and all too soon the train was back at the museum grounds. Will bought me a souvenir spike and as we said our goodbyes to each other, I thanked him for everything he did for me. I bought a coke to celebrate the accomplishment along with a route map of the old Hawaiian Railway and post cards to help remember this great day in my life. My train riding day was not over yet as Larry had planned for me to ride the two P.M. train with me riding up in the engine with him which was an enjoyable experience. On the return trip, I passed 577,000 rail miles which made me feel really good having done it in Hawaii which is why I made the second trip. I totally enjoyed my round trip in the engine and like they say all good things must come to an end so as we pulled back into Ewa Station, I thanked Larry for everything he did for me and making this day one of the most special in my life. I detrained saying my goodbyes to everyone before I walked back to my rental car and headed back to Waikiki through a heavy downpour with a very natural high after completing my goal of riding a train in all 50 States. Back at the hotel. I ordered room service for dinner, a steak/teriyaki platter which was excellent. I watched Sunday Night Football, called home with the good news that I had completed my goal and watched American Tragedy, The O. J. Simpson mini series on CBS before calling it a night, my last night in the State of Hawaii. Sleeping in late my last morning, I visited the hotel's sun deck for the first and only time during my stay finding a sheltered spot out of the high wind which was blowing. The warm Hawaiian sun felt so good on my skin. I call Maureen Angle's classroom at McFadden as we had prearranged because some of my students are in her 6th period class. I then checked out, filled the car with gas, returned the car and waited in line to get my boarding pass. I played the switch the gate on the passenger game prior to boarding my flight. My seat is in the oversea flight attendant rest area so I have so much leg space and a little TV monitor in front of me. From my window seat, I saw below me Molokai, Lanai, Maui and Kahoolawe Islands with the Big Island hidden away under a blanket of clouds. The movie was Disney's The Kid which killed off a good portion of the flight. Rush's All the World is a Stage was heard for most of the rest of the flight. We then became a night flight and soon the coastal lights of the LA Basin came into view. We banked with Malibu below, flew over downtown LA with me spotting both the BNSF and UP yards before we made a 180 degree turn for our final approach to LAX with a very gentle landing. Brad met me at the gate and drove me back to Santa Fe Springs to get my car which I drove home bringing an ending to my 50th State Train Riding Adventure. Sad Note: My Father Donald Guenzler died on 11:38 PM December 15, 2000 in the presence of myself and my brother Bruce. The funeral was on December 21, 2000.